OMG Posters! » Archive "Everything Is Going To Be Just Fine" Art Print by Mark Brabant - OMG Posters! Mark Brabant just released a new art print titled, “Everything Is Going To Be Just Fine”. 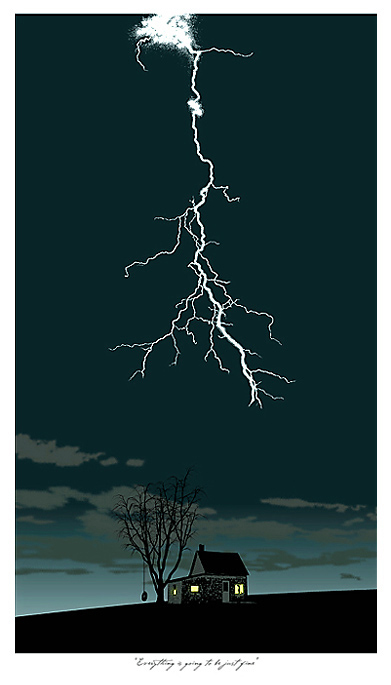 It is a 14″ x 24″ screenprint, has an edition of 160, and costs $35. Print nerds will also be glad to hear that the ligning was printed with glow in the dark ink. To purchase, visit HoveringObject.com. very cool and it glows!!!!!!! Who shat in Leon’s cereal?